Flixotide protects the airways from overstimulation. It contains the active ingredient fluticasone, which is a type of medicine known as a corticosteroid (adrenal cortex hormone). This medicine reduces hypersensitivity reactions in the lungs and decreases inflammation. 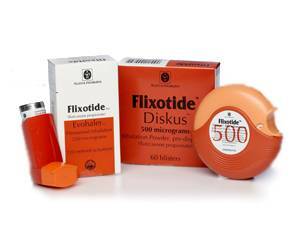 Flixotide is taken by inhalation and is available as two types of inhaler devices: the Evohaler and Accuhaler inhaler. Flixotide is a prescription-only medicine. Flixotide makes the airways less sensitive to asthma triggers such as smoke, pet fur, cold air and exercise. This helps to prevent asthma attacks. Flixotide is prescribed in patients with asthma, COPD (chronic obstructive pulmonary disease) and other respiratory disorders. Flixotide helps prevent asthma attacks. It does not work to relieve an ongoing asthma attack. For rapid relief of an asthma attack you need to use a bronchodilator (a substance that dilates the bronchi and increases airflow to the lungs). Flixotide is available as a spray and powder. The Flixotide Evohaler is a metered dose inhaler that delivers the medicine as a fine spray or mist. With this inhaler you have to coordinate pressing down the canister and breathing in the spray. The Flixotide Accuhaler is a dry powder inhaler. It comes pre-loaded with blisters containing individual doses of powder medicine that you inhale. It is important that you hold your breath for at least 10 seconds after inhaling to keep the medicine in your lungs. Consult the package leaflet for instructions on how to use your Evohaler or Accuhaler device. To minimise the chances of side effects affecting the mouth you should rinse your mouth with water after inhaling each dose. If you are also using a bronchodilator, you should use the bronchodilator first and then use your Flixotide inhaler. The bronchodilator opens up the airways, which will allow more of the active ingredient to reach your lungs. one inhalation of the prescribed dose, twice a day. Flixotide 250 mcg and 500 mcg are not suitable for use in children. Always follow the prescribed dosage and read the package leaflet closely before use. Rinse your mouth with water or clean your teeth after inhaling each dose to be sure that none of the medicine is left in the mouth. This will prevent side effects from occurring. For more information on side effects, see the package leaflet. Consult a doctor on the use of Flixotide if you have a health condition that is not listed above. Flixotide interacts with other medicines, including certain antifungal medicines. It is therefore important to tell the doctor what other medicines you are taking when you order. Flixotide should not be used by pregnant or breastfeeding women without consulting a doctor first.